If confirmed, this lake would likely cover up to 1,250 square km, which is about 80 times as big as Windermere, England's largest lake. The initial interpretation of a canyon system is supported by radar data that has been gathered in a couple of locations. Radar sees through the ice layers to the hard rockbed below. The story is consistent, says team-member Prof Martin Siegert, from Imperial College London, UK, said. "Discovering a gigantic new chasm that dwarfs the Grand Canyon is a tantalising prospect. "Geoscientists on Antarctica are carrying out experiments to confirm what we think we are seeing from the initial data, and we hope to announce our findings at a meeting of the ICECAP2 collaboration, at Imperial, later in 2016." Most of Antarctica has now been covered by full geophysical surveys that have imaged the continent's underlying topography. But there remain two "Poles of Ignorance" that need to be filled in. 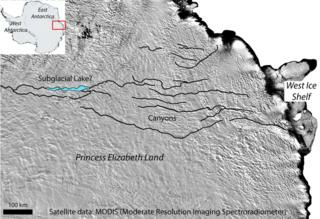 One of these is Princess Elizabeth Land; the other is the Recovery Basin. International teams - comprising scientists from the US, the UK, Australia, China and other nations - are flying sensors back and forth across thousands of square kilometres of ice surface. "If we don't know the shape of the rockbed, we cannot confidently build models that will produce sensible behaviours in the ice," asserted Dr Jamieson. The latest research is published in Geology journal.